“As the two-inch supply lines enter the building, they merge into a three-inch hydro-separator. 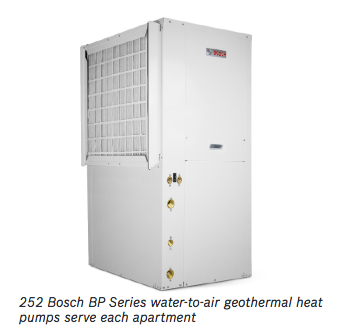 On the other side, they split back to dual, two-inch lines once again; one set for each half of the building.” Throughout the building, Bosch water-to-air heat pumps are tucked away in closets, and pull water from the supply lines. Each apartment has its own heat pump. Each of the eleven buildings plus clubhouse uses 20 to 24 geothermal units supplied by vertical ground loops for each building. A mechanical room in each apartment houses the geothermal unit and transfer fluid is pumped back to ground loop with variable speed circulating pumps. Each geothermal unit supplies heated or cooled air through ductwork with no additional auxiliary fans or backup heating system required. 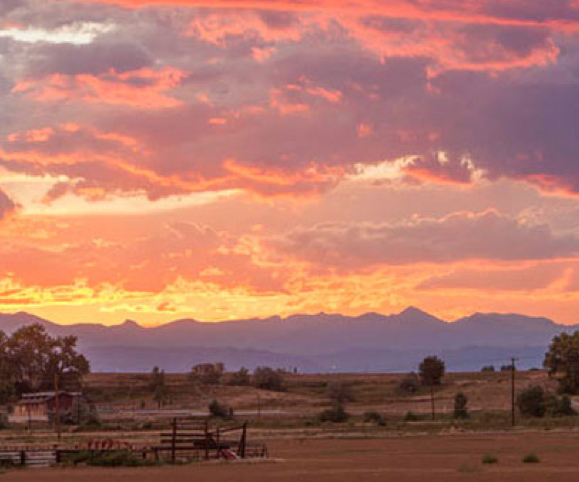 Vinton hopes that the Solaire project can serve as a blueprint for the development of other sustainable communities in Colorado and beyond. Key aspects that made the project feasible were the combination of power company and municipal incentives as well as partnering with reputable companies such as SMC Geothermal, the company that designed and installed the geothermal systems there. Overall energy use for heating and cooling is anticipated to cost approximately $110/year for one-bedroom apartments and $160/year for two to three-bedroom units. Lower energy costs, coupled with reliability and Bosch’s standard limited ten-year warranty, are strong points to attract residents.